This article concentrates on the tools that I typically use. If I did not cover your favorite tool, please forgive me and let me know via email what tools you use and why. 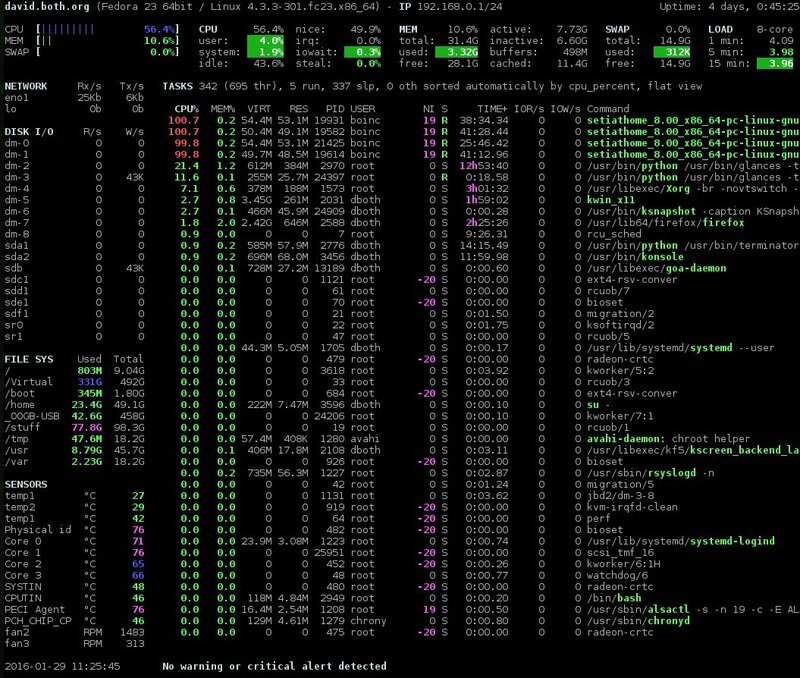 My go-to tools for problem determination in a Linux environment are almost always the system monitoring tools. For me, these are top, atop, htop, and glances. 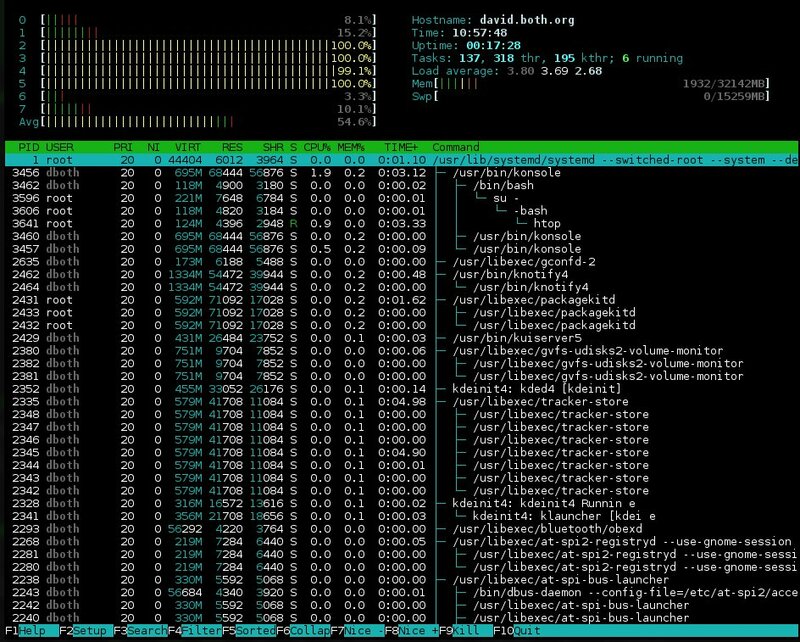 All of these tools monitor CPU and memory usage and most of them list information about running processes at the very least. Some monitor other aspects of a Linux system as well. All provide near real-time views of system activity. The top program is a very powerful utility that provides a great deal of information about your running system. This includes data about memory usage, CPU loads and a list of running processes including the amount of CPU time and memory being utilized by each process. Top displays system information in near real-time, updating (be default) every three seconds. Fractional seconds are allowed by top, although very small values can place a significant load the system. It is also interactive and the data columns to be displayed and the sort column can be modified. A sample output from the top program is shown in Figure 1 below. The output from top is divided into two sections which are called the “Summary” section, which is the top section of the output, and the “process” section which is the lower portion of the output; I will use this terminology for top, atop, htop and glances in the interest of consistency. The Summary section of the output from top is an overview of the system status. The first line shows the system uptime and the 1, 5 and 15 minute load averages. In the example below, the load averages are 4.04, 4.17 and 4.06, respectively. The second line shows the number of processs currently active and the status of each. The lines containing CPU statistics are shown next. There can be a single line which combines the statistics for all CPUs present in the system, or as in the example below, one line for each CPU; in the case of the computer used for the example this is a single quad core CPU. Press the 1 key to toggle between the consolidated display of CPU usage and the display of the individual CPUs. The data in these lines is displayed as percentages of the total CPU time available. The other fields for these CPU data have changed over time and I had a difficult time locating information about the last three as they are relatively new. So here is a description of all of these fields. Figure 1: The top command showing a fully utilized 4-core CPU. Click on the image for a full size version. The process section of the output from top is a listing of the running processes in the system — at least the for the number of processes, or processes, for which there is room on the terminal display. The default columns displayed by top are described below. Several other columns are available and each can usually be added with a single keystroke; refer to the top man page for details. Use the Page Up and Page Down keys to scroll through the list of running processes. The d or s commands are interchangeable and can be used to set the delay interval between updates. The default is three seconds but I prefer a one second interval. Interval granularity can be as low as one-tenth (0.1) of a second but this will consume more of the CPU cycles you are trying to measure. Before I go on to discuss the other monitoring tools, it is important to discuss load averages in more detail. Load averages are an important criteria for measuring CPU usage but what does this really mean when I say that the 1 (or 5 or 10) minute load average is 4.04, for example? Load average can be considered a measure of demand for the CPU; it is a number that represents the average number of instructions waiting for CPU time. So this is a true measure of CPU performance, unlike the standard “CPU percentage” which includes I/O wait times during which the CPU is not really working. This is also true for multiple processors. If a 4 CPU system has a load average of 4 then it has perfect utilization. If it has a load average of 3.24, for example, then three of its processors are fully utilized and one is utilized at about 24%. In the example above, a 4 CPU system has a 1 minute load average of 4.04 meaning that there is no remaining capacity among the 4 CPUs and a few instructions are forced to wait. A perfectly utilized 4 CPU system would show a load average of 4.00 so that the system in the example is fully loaded but not overloaded. top and all of the other monitors discussed here allow you to send signals to running processes. Each of these signals has a specific function though some of them can be defined by the receiving program using signal handlers. SIGTERM (15) Signal 15, SIGTERM is the default signal sent by top and the other monitors when the k key is pressed. It may also be the least effective because the program must have a signal handler built into it. The program’s signal handler must intercept incoming signals and act accordingly. So for scripts, most of which do not have signal handlers, SIGTERM is ignored. The idea behind SIGTERM is that by simply telling the program that you want it to terminate itself, it will take advantage of that and clean up things like open files and then terminate itself in a controlled and nice manner. SIGKILL (9) Signal 9, SIGKILL provides a means of killing even the most recalcitrant programs, including scripts and other programs that have no signal handlers. For scripts and other programs with no signal handler, however, it not only kills the running script but it also kills the shell session in which the script is running; this may not be the behavior that you want. If you want to kill a process and you don’t care about being nice, this is the signal you want. This signal cannot be intercepted by a signal handler in the program code. SIGINT (2) Signal 2, SIGINT can be used when SIGTERM does not work and you want the program to die a little more nicely, for example, without killing the shell session in which it is running. SIGINT sends an interrupt to the session in which the program is running. This is equivalent to terminating a running program, particularly a script, with the Ctrl-C key combination. Open another terminal session in a different window, position them adjacent to each other so you can watch the results and run top in the new session. Run the cpuHog program with the following command. I also like atop. It is an excellent monitor to use when you need more details about that type of I/O activity. The default refresh interval is 10 seconds, but this can be changed using the interval (i) command to whatever is appropriate for what you are trying to do. atop cannot refresh at sub-second intervals like top can. Figure 2: The atop system monitor provides information about disk and network activity in addition to CPU and process data. Click on the image for a full size version. atop contains much of the same information as top but also displays information about network, raw disk, and logical volume activity. Figure 2, above, shows these additional data in the columns at the top of the display. Note that if you have the horizontal screen real-estate to support a wider display, additional columns will be displayed. Conversely, if you have less horizontal width, fewer columns are displayed. I also like that atop displays the current CPU frequency and scaling factor – something I have not seen on any other of these monitors – on the second line in the rightmost two columns in Figure 2. The atop man page refers to global and user level configuration files, but none can be found in my own Fedora or CentOS installations. There is also no command to save a modified configuration and a save does not take place automatically when the program is terminated. So there appears to be now way to make configuration changes permanent. 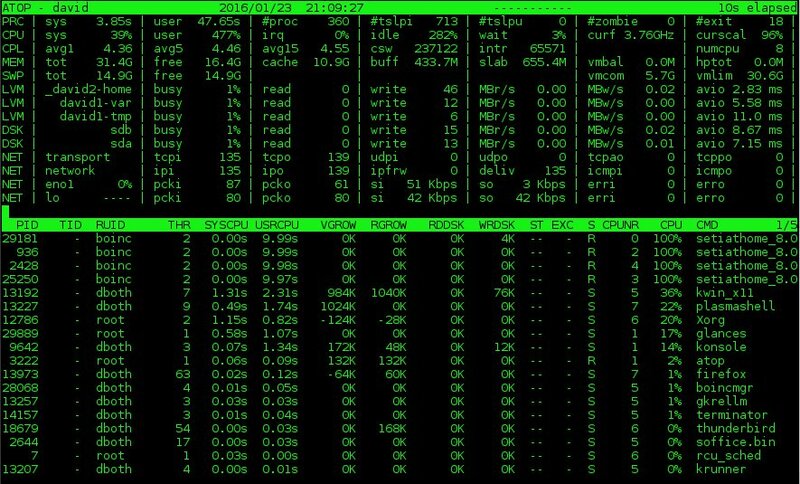 The htop program is much like top on steroids. It does look a lot like top, but it also provides some capabilities that top does not. Unlike atop, however, it does not provide any disk, network, or I/O information of any type. 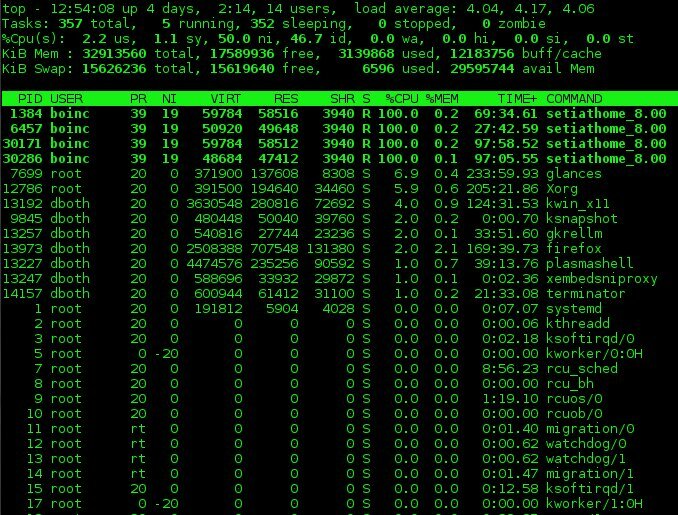 Figure 3: htop has nice bar charts to to indicate resource usage and it can show the process tree. Click on the image for a full size version. The F5 key allows you to select the sort column; it displays a list of the columns available for sorting and you select the column you want and press the Enter key. One command I especially like is F6 which displays the running processes in a tree format making it easy to determine the parent/child relationships of running processes. I have just recently learned about glances which can display more information about your computer than any of the other monitors I am currently familiar with. This includes disk and network I/O, thermal readouts that can display CPU and other hardware temperatures as well as fan speeds, and disk usage by hardware device and logical volume. Figure 4: The glances interface with network, disk, filesystem, and sensor information. Click on the image for a full size version. The process section displays the standard information about each of the running processes. Processes can be sorted automatically (a), or by CPU (c), memory (m), name (p), user (u), I/O rate (i) or time (t). When sorted automatically processes are first sorted by the most used resource. glances does not require a configuration file to work properly. If you choose to have one, the system-wide instance of the configuration file would be located in /etc/glances/glances.conf. Individual users can have a local instance at ~/.config/glances/glances.conf which will override the global configuration. The primary purpose of these configuration files is to set thresholds for warnings and critical alerts. There is no way I can find to make other configuration changes – such as sidebar modules or the CPU displays – permanent. It appears that you must reconfigure those items every time you start glances. You should also be aware that the act of using these monitoring tools alters the system’s use of resources including memory and CPU time. top and most of these monitors use perhaps 2 or 3 percent of a system’s CPU time. glances has much more impact than the others and can use between 10 and 20 percent of CPU time. Be sure to consider this when choosing your tools.